It’s too often that I come across great content in blogs or on websites but when considering sharing on Pinterest, other image sharing site or social media see that they haven’t fully taken advantage of their images on their blog. When you create a blog you obviously want to have awesome visuals to complement the story of the blog and further the instruction that you are using in your blog. However, too often people put powerful images on their blogs and don’t put any text on their blog or even their URL. 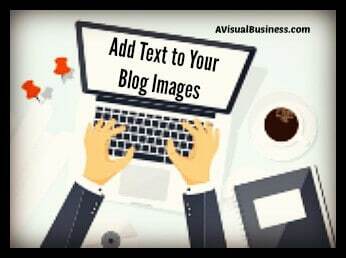 The main reason why adding your text or url/domain name would be important is if and when the blog or the image goes viral, it is linked back to the website, your website. Imagine that your blog with image doesn’t go viral but gets passed around, it is still easily accessible or at least recognizable back to you. Because, that shared interest is passed onto other social media image sites and comes back to your website because people see the URL that the image and the text is associated with. 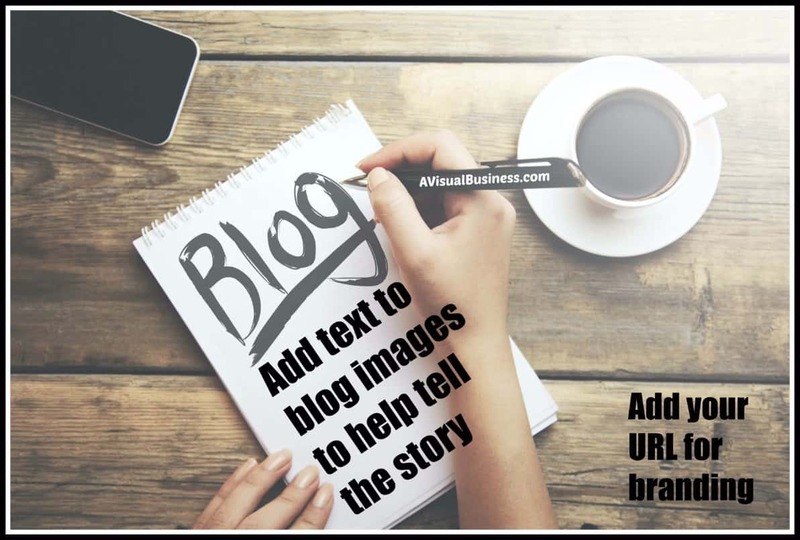 Add text to your blog to tell the story & brand your business by adding your url to your blog images. The text on the image is to tell how the image relates in that blog, what it’s purpose is. 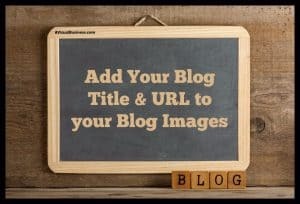 For example, you may use a fabulous image in the featured image and add the title of the blog as well as your url; should the image separate from the blog (like in Google images), then the name of your blog will always be there as well as your url. Further, you know folks are visual and use images to help them tell the story. Heck, I used 1-3 images and sometimes pin them on Pinterest under different boards because they may benefit various boards for various reasons but they all tell the total story. Placing text or your url on your images isn’t mandatory, of course, nor does it provide much SEO value; however much of SEO relates to the customer experience and if you are providing further explanation to the consumer, it could ultimately affect the SEO. What I mean is, if it is more valuable to the consumer, they may read more of your blog or more of your blogs because they see the value you are providing, whether they are seeing it via your words or how you tell the story through your images. Remember, folks are visual and they use images to help them explain the story. So, looking at the picture probably helps the consumer tell your story much quicker than reading your text or skimming it. Keep in mind, the consumer isn’t reading the whole thing. Seriously… don’t kid yourself, they aren’t! Bonus tip – Make sure that when you are saving your images on your computer, name it to explain what the image is, then prior to uploading your image optimize it and then when you upload it to your blog/website be sure to add your alt text to it. You will find more information about that in my other blogs within the links in this paragraph. 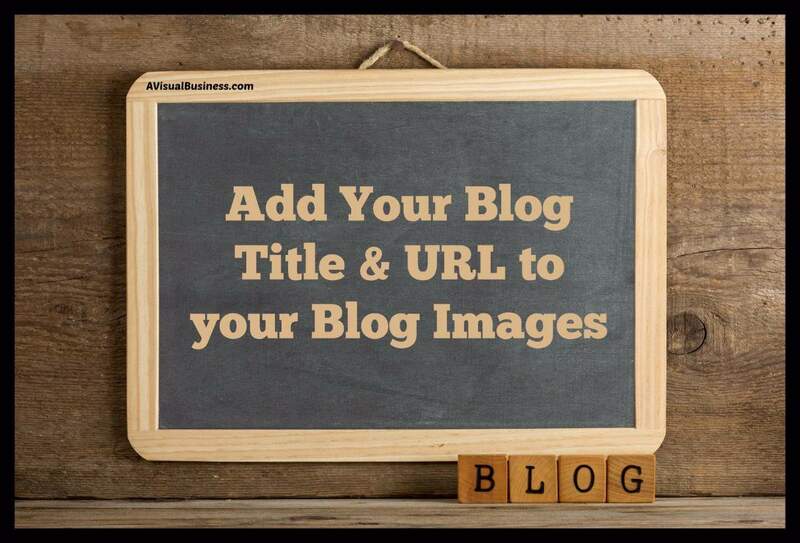 Your blog images can work for you in Pinterest, Google images and others – add text & your url. This is such a simple thing that you can do. Don’t just taking an image and slap it into your blog. Take the extra time to make it work for you. It really isn’t too hard. Drop (upload) your image in PicMonkey or Canva, add a frame (if you want) and then add text saying what the image represents in the blog, add your url then download the image to your computer. BOOM! Don’t forget to optimize your images so that they’re not too big and waste so much space in your bandwidth and slow down your website and upload. Should you have any questions about putting your title/text or URL on your image or optimizing your images for your website please let me know I would be happy to help. Don’t forget that I can help you with optimizing your website to get more visibility within the search engines. Contact me with any questions. A nice article and written preciously with a good message about making sure that photos are posted correctly. Appreciate the fine work. What a great tip, Kristen! I think I do this–but didn’t really know why. Technology and me 🙂 Great explanation! Makes sense Kristen. Will be adding this to my to-do list. This is a great tip. Also, your note about renaming the image is a good one. These are easy to skip steps but they add so much value. Thanks Renee, did that one a few months ago! Great tip, Kristen. I agree it is important to make the process of sharing as easy as possible and if the blogger can add additional information to images, all the better. People will be more willing to come back and share even more images/content. Thanks for the reminder.. Yes, more info in this side is better… and better sharing… mo better Sabrina! Great tips Kristen. I know my posts do better on Pinterest when I have text on the images and I’m getting better at doing this. I keep forgetting to rename the pics before I upload them but have a big sticky note reminding me to do this now. I use a watermark app to put my URL on each image. Easier to refer back to them Tami when they do have that info on them. I’m glad you are getting better at all of it. Great suggestions, Kristen. I didn’t realize how much images can slow down the website! So funny that this is your blog topic. I am getting some templates created and was just thinking that I would begin adding the blog title on my feature images. Going to work on optimizing those images also. Thanks! We learned this some time ago & it absolutely makes a difference. Often it is the simple steps that don’t get explained and we go forever not knowing. So glad you cover this and all your other wonderful tips. Great post. I’ve heard this before, the benefits od adding text and url’s to images. But I haven’t been doing it consistently. Thanks for the information and the links. Hope you begin to start doing it Jane! It appears that when I upload an image to my media library on my site, it adds the URL of my site. I then name the image that relates to my post and then create an alt tag describing the image more fully. Not sure if this covers all the suggestions you made in this post, Kristen. When you say text on your images, do you mean like I have been doing which is adding a quote and then my logo? Even though I don’t personally do Pinterest, I would love to be optimizing my images for those who do pin my posts. Thanks for another tip-filled post! It sounds like you are doing the right things Bev – name your image, alt tag, then image physically ON the image as well as your ulr ON the image. Pinterest is an evergreen social media.. you should consider adding all yours there. You are welcome Bev. Great tip. This always puzzled me. I’ll share that RelayThat.com will do some of the work of adding keywords for you to your graphic. I love using it. That’s interesting Dina, never heard of that.. but you need to be sure you are adding your alt text and text ON your images as well. Amazing how Google picks up your graphics when they’ve been named correctly. I had no idea that adding a link helps too. I do believe all images make it to Google.. but it’s how you save yours that makes the difference. Great post and great explanation. This is definitely an area I can improve on glad I have your blog to refer to. I need to break this down to a few methodical steps. Great point Robin, you have so many visuals that could be sent around the internet so you especially need to add your URL’s. Great post and valuable tips!! I am so glad that you find so much value in what I offer Joan. I am also glad that you are following through! YAY! Great article! I’m learning more each day and utilizing the strategies for my business. This was very helpful . Love this post, Kristen! I started out putting the URL on my blog post images but then stopped – although I am not sure why. I will definitely start doing that again! Great article and although I do add text and logo/URL to images I set them to the size that looks best on the website and Facebook, which isnt necessarily optimising them. So after reading your other article about optimisation, I am now getting the PSmush plugin. Thanks for the tip! Awesome Suzii and even having the dimensions, you can still optimize them to make the total size right and you will have both! SCORE! thanks Kristin. I often let this slide when creating my images. I do make sure my photos link back to something on my site but need to be more cognizant of the value and get this DONE! Awesome Alene, so glad you do part of it.. now to get you to do the rest. This is such a great idea! I downloaded Canva previously but haven’t mastered it yet. I love all the valuable information you share. It’s on my “to do” list! Canva is great Candess… so is PicMonkey and might be easier for you too. Great suggestion, Kristen. I have only put my URL on one blog post and I didn’t think it looked that great visually – BUT it was my first post to really garner any social media attention. I will have to start adding it to all future posts. Really great idea! Find a general location (say bottom right) and stick it there, make it smaller and it won’t stick out as much. It’ll benefit in the long run Brenda! That’s a great idea! I already put my url and logo on my featured image, but putting them on all the graphics in a blog post is clever. I do put text on my images but not my url. Will have to do that. I also create different size images such a pin sized image and hide it but it is there when someone wants to pin. URL is so vital Karen.. glad you are doing part of it. I believe most my blog posts include text and my URL. This is super helpful to do if the blog post gets pinned on Pinterest. You should be pinning your own blogs there Geniece… so much value if you do… Pinterest is more evergreen than any social media. Cool! I haven’t pinned any of my blog posts in a while so I have some work to do. Thanks! You should do it with every blog Geniece! You taught me well Kristen, my website and blog titles are on all of my images! Thanks! I love the tips Kristine. I always just add my keywords to the images but I think I would heed to your advice and optimise them better. I could dink around all day and half the night, playing with images and text (alt and other). Sadly, no one pays me to do that to I have to make money, too. 🙂 All great points, Kristen, and explained simply, too. Such a gift! You may notice that I made sure to do that on my most recently post! Yes ma’am.. so proud of you Jennifer! A great article on URL Optimization. I really enjoyed the article and referred back to again leave you another comment. I wrote down the important aspects of the article and going to implement them in the next article with my Pictures. Awesome Lori.. I appreciate it and glad you are seeing such value. I’ve been working on a number of drafts using your advice in this post for my general (writing) interest blog and business blog. I just published my first of several I have started for my general interest blog. I’m looking forward to seeing how this works for me on both blogs. Wow Patricia… that is awesome… I’m sure it will work well for you!